Low cost iron suitable for the hobbyist and for small domestic or electrical soldering tasks. Spare bits not available so consider this a cheap throw-away item, although it will probably last for years if you use it only for the occasional repair. I recommend you make a stand using a block of wood and a wire coat hanger. Much cheaper than buying one! Fully built and calibrated £59.95 (includes test probe leads). Trying to align your dish accurately on that satellite 23,000 miles away? You need this Satellite Finder. Powered from the receiver - or external battery. Lights up meter display (which also shows that receiver is sending current to the LNB). Sensitivity adjustment. 390-6361 Mini Vice with 60mm jaw opening. This is a lightweight, hollow diecasting. A tiny plastic vice which has a lever-action suction base to clamp it firmly to any smooth surface. Ideal for holding fishing flies and other small items while you work on them. Sorry, no longer available from original supplier! 390-1106 rounded-end tweezers are serrated to give a good grip. low cost! Stainless steel (antiacid and non-magnetic). can even be used left-handed! Ideal for picking up tiny objects used in jewellery making, dolls' house construction and other hobby work. Also handy for picking fleas out of the cat's fur but no use at all for plucking eyebrows. For cropping component wires and copper wire used in electrical circuits. (Not suitable for steel wire). Appearance may vary. Approx. 5" (170mm) in length. For cropping component wires and copper wire used in electrical circuits. Approx. 4.25" (110mm) in length. Ball-jointed crocodile clips on a stand with magnifying lens. Use it to hold small objects while you work on them. Ideal for powering your electronic projects, mini-drill etc. 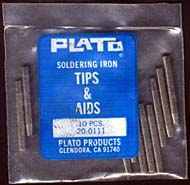 Soldering iron tips for very early irons manufactured by PACE in the USA.